On Wednesday, January 9 last, the Religious Affairs Correspondent for The Irish Times Patsy McGarry reported that the Mother and Baby Homes Commission of Investigation was to seek an extension of a year before publishing its final report which was due in February. The report took survivors, family members and supporters of people who lived in the Bon Secours Mother and Baby Home by surprise. Following on from the report in The Irish Times, Broadsheet contacted the Department of Children and Youth Affairs on January 9 and asked a spokesman to confirm if The Irish Times article was correct; if it was, to set out the reasons for the seeking of an extension; to outline when the MBHCI made the request for an extension of Government; and to explain when the survivors/survivors’ groups were informed of the request. 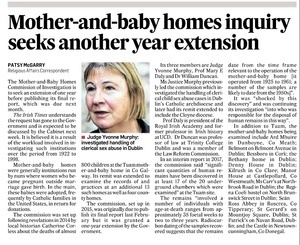 “The Commission of Investigation into Mother and Baby Homes has written to the Minister to seek an extension to the time frame for delivering its final reports. The Minister is considering the request and will meet the Commission next week to discuss it further. “The Minister will then respond to the request in consultation with her cabinet colleagues. “The Minister has given a commitment to interested parties to communicate any updates in relation to the Mother and Baby Home issue in as timely a manner as possible. 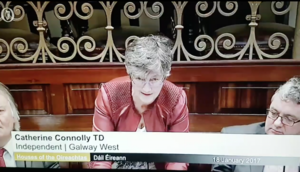 Yet, when the matter was raised with Minister Zappone in the Dáil last Thursday evening by Galway West Independent TD Catherine Connolly, Dublin Fingal Independent TD Clare Daly, and Dublin South Central Independent TD Joan Collins, Ms Zappone said “the coverage was misleading”. She also eventually confirmed, after being asked several times, that she had received the request from the commission in December. “I ask the Minister to correct me if I am wrong, but my information is that the report was finalised in early December last and had been sent to the Attorney General pending transmission to the Minister and the Cabinet. “I have also been informed that more files from the HSE have emerged which is why, potentially, a further delay is being sought by the commission. “Survivors have been waiting anxiously for this report, as the Minister knows, and have been physically and emotionally shattered by the announcement in last week’s newspaper. It was a cold and calculated way to inform survivors and their families. “The request for a second extension from the commission is the last straw for many of us here and certainly for many of the survivors. The request should be refused. “I am very curious to hear what the Minister’s attitude is and what level of warning she was given by the commission that this bombshell would drop a year almost after the last extension was granted. Many felt it was a step too far even then yet a year on, here we are. “It is jaw-dropping to have a scenario in which four years later, we have had three interim reports comprising fewer than 40 pages between them. Of those interim reports, two sought more time while another focused on process. There have been no details and no findings and we must ask what in God’s name is going on in this gathering. “As Deputy Joan Collins said, a suspicious person might wonder if things were being done in this manner so the community dies off. “The fact that they had to hear this as they did via a newspaper leak has caused more insult to them. In many ways, the process is as important as the outcome. The process here has been an abysmal failure and it has retraumatised many of the survivors. “Has the commission of investigation asked for an extension of time? If so, when was the request made, how was it made and how long has the Minister known? “…From day one, there was confusion and delay. The third report asked for extension of time. While it caused real upset then, people accepted the assurance that the report would be published in February of this year. “…Subsequent to what we found out in Patsy McGarry’s newspaper report earlier this month, it was claimed on the Department’s website that “reports in the media did not come from this Department and the speculation contained in these reports is inaccurate”. “The scope of the investigation is broad. It was acknowledged at the outset that the timeframe was ambitious. I received the fourth interim report in December 2018. I met the chair of the commission, Judge Yvonne Murphy, last week to discuss the request for the extension of the timeframe for the delivery of the commission’s reports and to ensure I had a full understanding of the progress to date and the basis for the additional time being requested. “I know it is important for the commission to complete this sensitive and complex work as soon as possible… There can be no shortcut to finding the truth. “The interim report is short. Contrary to what the Deputies have suggested, it is not a proposal. It grounds the request for an extension of the timeframe to deliver the three reports from the commission by one year. “As the request constitutes a change in the terms of reference of the commission, it is a matter for the Government to consider the request in reflection of its statutory provisions. Government approval is also required to publish the report. With this in mind, I intend to bring a memorandum to the Cabinet. “I have already circulated a draft of the memorandum to Government Departments. I hope to have it on the agenda next week for discussion. Ahead of the Cabinet meeting, it would not be helpful to speculate on what the Government will decide. “I am conscious that the commentary on this issue in the media last week has caused distress and anxiety for those involved in this process. The coverage was misleading and did not originate from the Department of Children and Youth Affairs, as one of the Deputies mentioned. Ms Collins told Ms Zappone that she still didn’t answer her questions, namely when the commission requested an extension, if it was made at the beginning of December and, if it was, why weren’t the survivors not informed of this request before reading about it in The Irish Times. Ms Daly said the essence of what was in The Irish Times article was correct – in so far as the final report will be delayed by a year. She called for a report to be published in February outlining exactly what the commission has done to date, what needs to be done and a timetable of when the work will be done. “I am afraid I am not so sympathetic. I am holding the Minister to account because her answer is not acceptable. When and how was she approached by the commission in relation to an extension? Why are the grounds for an extension not set out in the Minister’s reply? Why do we not have a copy of the report? The lines that should demarcate who is responsible for what are being blurred. “An independent commission of inquiry was set up. It has a duty to report in a way that we can see, read and look at. It is not acceptable that the Minister is not telling us where the report is, why we do not have it and what the grounds for the request are. It is ridiculous and utterly unacceptable that she is telling us there are grounds for the request but not telling us what those grounds are or when they were set out. “The Minister referred to a meeting that took place last week. If there is a shortage of staff, as has been mentioned, we should know about that. If there is a reason the work cannot be completed on time, it should be made known to us in an open and accountable manner. That is the least we deserve in this Dáil so we can represent the people outside who have suffered greatly. It was after this contribution from Ms Connolly that Ms Zappone said the request was made in December. “It is an interim report. “There are procedures in terms of the establishment of the independent commission and the commission has requested an extension for the completion of its work. That request must be presented to Government, which must agree or not to it. Once that has happened, there will be the publishing of the report. “That is the process and those are the procedures. “I intend to do that at the next Cabinet meeting. When I have provided my Cabinet colleagues with the rationale for this, in addition to advising them of the discussions I had with Judge Murphy, which I sought as soon as I could subsequent to the presentation of that interim report taking account of the Christmas period, I will engage with my Cabinet colleagues and we will make a decision. “We will let the survivors and those primary stakeholders know. I will publish the report and we will publish our decision. Those are the proper procedures. The Deputies will know then what is the rationale in that regard. I am happy to come back to the House and discuss those issues with them. “Second, as the Deputies well know, this is an independent commission and therefore there are certain things I can and cannot do. The commission has made this request and laid out its rationale. I am able to talk and have talked to it about that – I have spoken of that – to more deeply understand its rationale in this regard. Posted in Misc and tagged Catherine Connolly, Clare Daly, Joan Collins, Katherine Zappone, Mother and Baby Home Commission of Investigation, Tuam at 12:38 pm on January 21, 2019 by Bodger. Independent TD Catherine Connolly raised the Bon Secours Mother and Baby Home in Tuam, Co Galway. Specifically, she raised concerns about Taoiseach Enda Kenny using “carefully crafted words” to tell the Dáil, “no nuns broke into our homes to kidnap our children”. 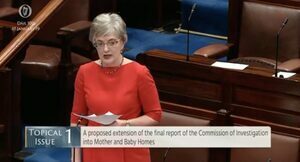 And she recalled an interim report the Commission of Investigation into Mother and Baby Homes gave the Minister for Children Katherine Zappone last September. This interim report was to identify any matters that the commission felt warranted further investigation as part of the commission’s work and, recently, the Adoption Rights Alliance and Justice for Magdalenes Research groups have called on Ms Zappone to publish it. “By the witnesses, the many, many women who went before the commission of inquiry into child abuse which culminated in the Ryan Report, as far back as 2009. They told their stories about their experience in Mother and Baby Homes. It was brought to the attention of Martin McAleese when he concluded his report on the Magdalene laundries. So none of this is shocking to the survivors. 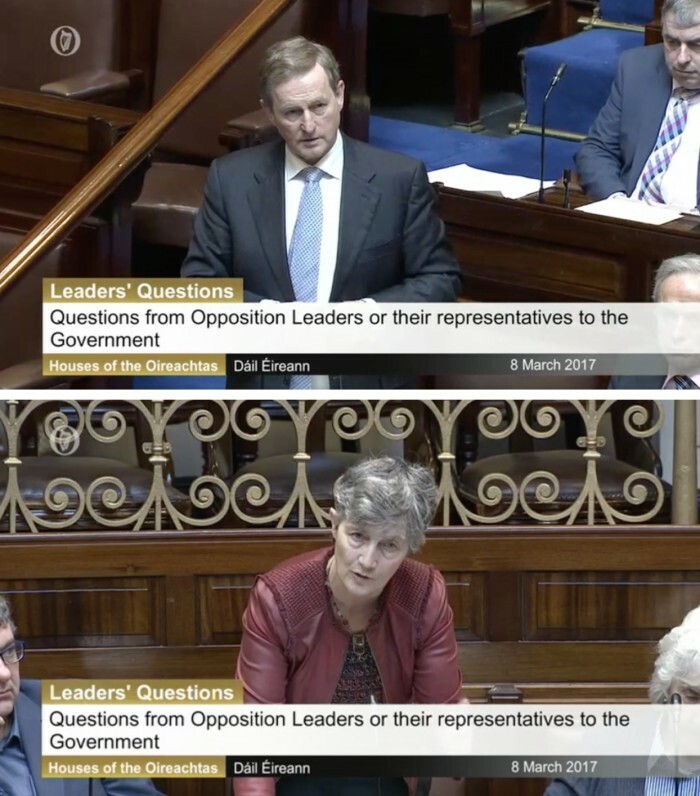 Posted in Misc and tagged Catherine Connolly, Dail, Enda Kenny, interim report, mother and baby homes at 1:42 pm on March 8, 2017 by Broadsheet. Independent TD Catherine Connolly raised concerns about Galway University Hospital with Taoiseach Enda Kenny. “Taoiseach, it’s operating in code black alert – the highest emergency code, together with a full capacity on an ongoing and prolonged basis. As a direct result, quite clearly, the obvious things happen, elective surgeries have been cancelled, large numbers of people have been left on trolleys, reaching a peak of 50 at Christmas time. “And, in addition, and directly arising from that, we have an ongoing review of an operation performed in a ward; we’re awaiting a review of a death of somebody on a trolley in their 80s; we’re awaiting the conclusions of a report in relation to spinal surgery, inappropriately carried out in some places and causing premature deaths in two cases. “We’re still awaiting confirmation that all of the recommendations of the Savita case have been implemented. In addition, we have very ill patients walking out of casualty on a daily basis and we have people with mental health problems being shoved through casualty. Posted in Misc and tagged Catherine Connolly, Dail, University Hospital Galway at 2:15 pm on January 18, 2017 by Broadsheet. 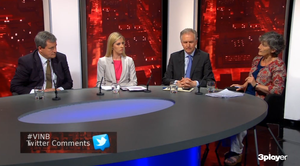 On TV3’s Tonight with Vincent Browne. The panelists were Fine Gael TD Kieran O’Donnell, Fianna Fáil TD Lisa Chambers, Vincent Toland, of the Financial Times and Independent TD Catherine Connolly. Connolly: “I’m not backing anything. I’m looking at the judgement. 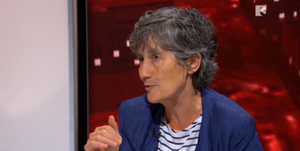 Posted in Misc and tagged Apple tax, Catherine Connolly, Lisa Chambers, Tonight with Vincent Browne at 1:24 pm on September 8, 2016 by Broadsheet. 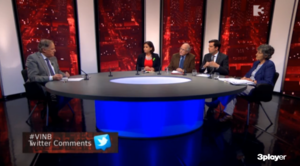 Last night, Tonight with Vincent Browne’s panel discussed the fallout of Brexit. The panel included Sinn Féin vice president and Dublin Central TD, Mary Lou McDonald; retired Senior Lecturer Emeritus in Social Policy at Trinity College Dublin, Anthony Coughlan, Fine Gael TD for Dublin South East, Eoghan Murphy; and Independent TD for Galway West and barrister, Catherine Connolly. “I thought I’d reached an age where I wasn’t shocked. But to see Peter Sutherland saying that, ‘we must find a way to rerun this referendum’ or to see Tony Blair come out saying, ‘it has to be rerun’ actually has shocked me. I thought I was beyond shocked. “I cannot believe what the establishment have done prior to Brexit, during Brexit and after Brexit. I’m absolutely full of admiration for the English people who have stood up to a terrible bullying campaign. I would have no truck with anti-racism [sic], nor the famous poster with refugees, I abhor it and I appall it. They stood up and said ‘We see the EU for what it is’ or, at least, that’s what I’m taking out of it. Is it the start of a new dawn? I do not think so. But I think it’s the first step in exposing the EU. “I think it’s exposed again now and I think it’s open for us to grab that opportunity and not let the Right have the narrative or tell the story. It’s up to us to grasp it. How could you possibly say that the EU is good, as it stands when we have a country where we have to get permission to build homes for our people – that came out recently the committee, that we have to get permission to fiddle with the fiscal treaty to get money, how can we possibly say that this EU is a social EU that allows 10,000 minors, unaccompanied minors go missing in Europe and we haven’t had one single urgent debate at EU level in relation to that. On top of that, we have the Lisbon Treaty and I’m all for a social Europe, I’m all for Europe. However, the Lisbon Treaty, which I canvassed against and I canvassed against it after reading it in detail. I would hope that there was scope in that Treaty to bring out social Europe but I’m afraid the emphasis is on the militarisation of Europe, page after page, and we made this point at the time. It’s in relation to the neoliberal agenda page after page, in relation to freeing up the markets. “But I think it’s dominated by clauses that have a neoliberal agenda and dominated by the militarisation of Europe. Posted in Misc and tagged Brexit, Catherine Connolly, Vincent Browne at 11:36 am on June 28, 2016 by Broadsheet.